The world is vastly underestimating the benefits of acting on climate change. Recent research from the Global Commission on the Economy and Climate finds that bold climate action could deliver at least $26 trillion in economic benefits through 2030. This groundbreaking research, produced by the Global Commission and more than 200 experts, highlights proof points of the global shift to a low-carbon economy, and identifies ways to accelerate action in five sectors: energy, cities, food and land use, water and industry. Our blog series, The $26 Trillion Opportunity, explores these economic opportunities in greater detail. Despite growing attention on clean energy, fossil fuels still account for 80 percent of global energy consumption and 75 percent of greenhouse gas emissions. Our fossil fuel-based energy system comes at a massive cost. Fossil fuels drive economic vulnerability, where countries and businesses are subject to volatile fuel prices; many are reliant on costly energy imports. Coal, oil and gas also increase human vulnerability: Dangerous outdoor air pollution due to fossil fuel burning kills 4.2 million people a year globally, according to the World Health Organization. 1. Eliminate fossil fuels subsidies and put a price on carbon. Subsidies and other support to fossil fuel production and consumption have declined recently, but still amounted to $373 billion a year in 2015. Subsidy reform combined with carbon pricing could generate an estimated $2.8 trillion in annual government revenues or savings by 2030. 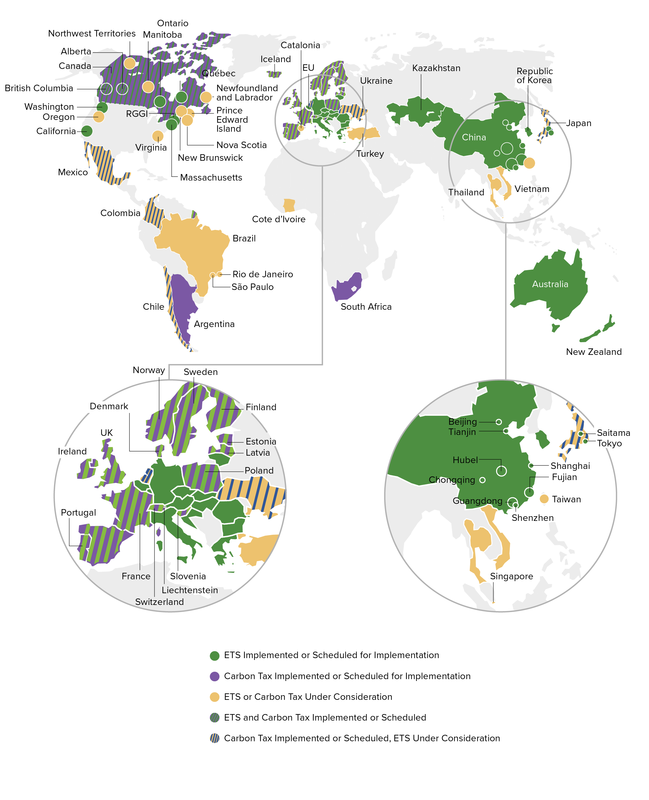 Evidence from the 70 national and subnational economies that have put a price on carbon or are about to shows it does not slow economic growth, but provides a clear and steady signal for business, industry and consumers to shift course. Even where carbon pricing is not yet in place, businesses and development finance institutions can implement shadow carbon prices to steer investments away from increasingly risky fossil fuel options. These measures will help reveal the value proposition of renewables and energy-efficiency and level the playing field for investment. 2. Step up investment in energy efficiency. Innovative financing for improved energy efficiency in buildings is already powering economic growth, but we need to step up and expand the scope of policies to get investment to flow. Setting standards for buildings and appliance efficiency, better public procurement, combined with innovative financing and leveraging public-private partnerships have demonstrated results across the world. In India, a government-backed company, Energy Efficiency Services Limited, pools procurement to grow markets for high-efficiency lighting and appliances. The arrangement delivers more than 35 billion kilowatt hours in annual energy savings and $2.3 billion in cost savings. Other programs, such as the Property Assessed Clean Energy Programs (PACE) in the United States and those led by KfW in Germany, provide low-cost financing for energy efficiency investments, with impressive results. Combined, these two initiatives have saved billions of dollars over less than a decade of operation. Energy efficiency investment also generates up to three times the number of jobs as the same investment in fossil fuels. 3. Create the conditions for phasing out coal. Diversifying economies, particularly those that are fossil fuel-rich, is not easy. Although renewable energy companies employed 10.3 million people worldwide in 2017 and are the fastest-growing source of jobs in several countries today, there will be transitional impacts at the regional and community levels. Even businesses that stand to gain from a phase-out of coal will benefit from government-led initiatives designed to deliver a just transition. As China has delayed or stopped work on 151 coal power plants, for example, it has also created a $15 billion fund for retraining, reallocating and early retirement of the estimated 5-6 million people who would be laid off due to coal or steel sector overcapacity. Businesses can also play a proactive role. Italy’s ENEL utility is transitioning out of coal, but is doing so while generating employment in affected communities. ENEL’s closure of 23 coal-fired power plants happened in agreement with the sector unions. ENEL guaranteed that there would be no involuntary redundancies, and that the workforce would be redeployed within the company. ENEL also sought out employment-generating solutions in communities serviced by coal, such as building renewable power or technology hubs. Disclosure policies to reveal climate-related financial risks can also help shift private investment. More than 500 companies have committed to support the recommendations of the Taskforce for Climate-related Financial Disclosures, and a number are starting to apply them. Such policies provide investors with the information needed to develop transition plans and strategies to manage risks, such as for stranded assets in the power sector due to continued investment in coal. 4. Improve access to electricity and clean cooking. 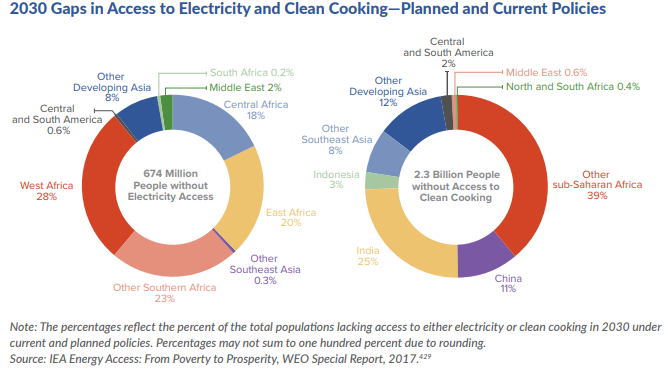 By 2030, population growth combined with policy and financial gaps are expected to leave nearly 700 million people without power, and more than 2 billion without clean cooking. The potential for universal clean energy access to deliver economic and human health benefits is huge. Solar breakthroughs combined with high-efficiency lighting and appliances are lowering costs of household electricity, while innovative consumer finance is improving affordability and expanding markets for decentralized solutions. According to the IEA, universal access to clean cooking alone could avoid 1.8 million premature deaths annually by 2030, free up billions of hours spent cooking or collecting fuelwood, and improve livelihoods for hundreds of millions of women. Policy reforms can incentivize private finance and investment. There is also opportunity to better target and blend public finance to scale investment and attract the private sector to the next frontier of energy access technologies, notably renewable mini-grids and clean cooking. Development finance can support a diverse range of renewables, including off-grid and mini-grid options, and can scale up attention in clean cooking. In clean energy businesses, training and support for women entrepreneurs has shown promising results. Making women’s employment a priority could accelerate market growth and the benefits of action. For example, Grameen Shakti in Bangladesh has trained 3,000 women as solar technicians to install and maintain Solar Home Systems in rural areas. Since 2003, 4.12 million solar systems have been installed, increasing per capita income 9-12 percent, creating 115,000 jobs and reducing carbon emissions by 160,000 tonnes per year. Moving from brown to green energy is the direction of the future, one that is ripe with business opportunities and near-term benefits such as cleaner air and new jobs. It is not an option; it’s an imperative to achieve a better economy and better lives. A version of this blog post originally appeared on Foresight Climate and Energy.